Thanks to all who voted and commented, this was my first entry and learned alot this week. My next entry is bigger! And hopefully better. At first, I didn't quite see how embedded the sign was... but once seen, ouch! You might want to try to find a way to separate the sign from the rest, shallower DOF would be a starting place, then more color separation.e.g., partly agains the sky, although the matching background leaf and sky tones are a contribution. Picture is kinda small....hard to see the details. Interesting shot. Looks like it's also a target for hunting season. I like how the colors in the sign compliment the color of the sky and trees. Would prefer to see a larger image for more detail. very cool subject. i wish the picture had been larger and less grainy. the angle is very nice -- i think a lot could have been made of this picture but it falls a bit short. That's quite a find! 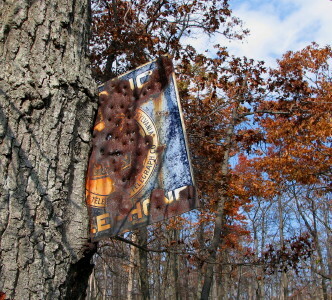 I wonder how many years that tree has been growing around the sign? Nice job with great matching background. Your photo is a little small, sort of hard to pick out, but seems ok. I wish this was bigger so I could really see it. size really does matter. Try for a min of 500px on one side. Proudly hosted by Sargasso Networks. Current Server Time: 04/24/2019 09:51:20 PM EDT.